The Niwot Ridge Long-Term Ecological Research Site (NIWOT) was established in 1980 as an alpine study area that is entirely above 3000 m in elevation. NIWOT is located in the Front Range Mountains, at 3000-3500 m elevation, in the southern Rocky Mountains. 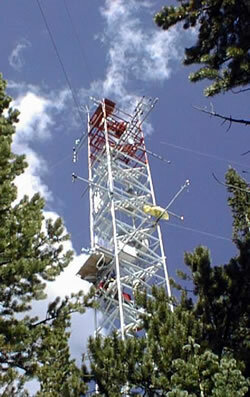 The site (40° 03'N, 105° 36'W) is about 35 km west of Boulder, CO. The research area is bounded to the west by the Continental Divide. 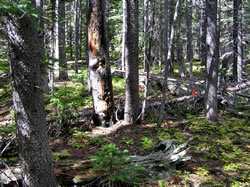 NIWOT vegetation is characteristic of subalpine forests. Subalpine fir (Abies lasiocarpa) and Engelmann spruce (Picea engelmannii) are the dominant tree species at higher elevations, and Lodgepole pine (Pinus contorta) at lower elevations, with some minor occurrence of Limber pine (Pinus flexilis) and Trembling Aspen (Populus tremuloides). In measured plots, maximum tree age is 133 years, tree density is 1,726 stems per hectare, tree height is 10.3 m, and LAI is 3.6 m2/m-2. Understory vegetation is generally herbaceous annuals or perennials, vaccinium species or willow (Salix spp.) shrubs. The NIWOT climate is characterized by cold and relatively long winters, with a mean annual temperature of 1.5 °C, and mean annual precipitation of 800 mm. Freezing temperatures may be observed at any time of year. Most precipitation falls as snow, and snow cover lasts from as early as October through June. Summer precipitation occurs primarily as afternoon thunderstorms. The NIWOT was established in 1980. The LTER program, based from the University of Colorado-Boulder, is administered through the Institute of Arctic and Alpine Research (INSTAAR) in cooperation with the Mountain Research Station, with special use permits from the USDA Forest Service. NIWOT is located within the Roosevelt National Forest and is designated as an Experimental Ecology Reserve (USDA Forest Service) as well as a Biosphere Reserve (United Nations Educational, Scientific and Cultural Organization, UNESCO). Disturbances in this region of the southern Rocky Mountains are typically characterized by infrequent, extensive stand-replacing fires, episodic insect outbreaks, and occasional wind damage. NIWOT was clearcut between 1900 and 1910, and fire history for the area is unknown, but remnant stumps and the logging itself suggest the forest was mature and possibly 200 years old at that time. Several ongoing studies are conducted at NIWOT involving global change, and specifically climate change and nitrogen deposition. Interactions between climate and ecosystems with complex topography which generate unique source and sink environments for water and nutrients, are examined at these high elevation sites in the Colorado Front Range. NIWOT has one NACP intensive landscape research and monitoring site with 12 FIA style plots (4 subplots per plot) and 13 single radius plots. Nine FIA style plots were established in 2004 within a 1km2 area and 3 additional FIA style plots established in 2005 outside the 1 km2. Thirteen additional single radius plots were established in 2008-09 within the 1 km2. Tree (>=10cm dbh) and sapling (2.5 – 10 cm dbh) species, status (live or dead), dbh, total height, live upper and lower crown height, live crown width, crown class (indicates amount of sunlight received) and decay of standing dead. Seedling count by species (< 2.5 cm dbh). Collection 2004–05, and 2008–09. Estimated using species specific and Jenkins et. al. (2004) allometric equations. Including coarse and fine woody debris estimated. Collection 2004–05, and 2008–09. Mass collected and C:N ratio analysis. Collection 2004–05, and 2008–09. Mass collected and C:N ratio analysis in 2004–09 . Sampled in 3 m x 3 m plot. Plots established in 2006, collection and C:N ratio analysis in 2008–09. Niwot Ridge AmeriFlux site characterization; elevation, geology, land cover and soils. Discrete LiDAR data was collected in 2005 by Airborne 1 (El Segundo, Calif.) using an Optech ALTM 2025/2050. Derived from discrete LiDAR data (25 m resolution) collected in 2005 by Airborne 1 (Sherrill et al. 2008). Stand age (site age) calculated from site tree age. Original cores collected in 2004-05; recorded in 2009. Shrub (vaccinium spp.) foliage and aboveground herbaceous biomass, collected using destructive sampling methods, and C:N ratio analysis. Collection 2004–05, and 2008–09. Shrub and herbaceous cover estimates. Collection 2004–05, and 2008–09. Ingrowth cores measured root biomass production. Established 2005, harvested 2008. Bags measured litter decomposition and C:N ratio analysis. Established 2005, harvested 2009. Collected simultaneously with summer soil CO2 respiration 2004–08. Derived from discrete LiDAR data (25 m resolution) collected in 2006 by Airborne 1. 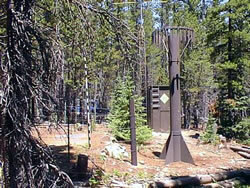 The NIWOT flux tower is located in Subalpine mixed coniferous forest with very little understory and has been in operation since 1997. The phenology camera automates near-surface remote sensing to provide continuous, real-time monitoring of vegetation phenology across a range of ecosystems and climate zones. The camera has been collecting data at Bartlett since 7/23/2009. Bowling, D.R. ; Massman, W.J. ; Schaeffer, S.M. ; Burns, S.P. ; Monson, R.K.; Williams, M.V. 2009. Biological and physical influences on the carbon isotope content of CO2 in a subalpine forest snowpack, Niwot Ridge, Colorado. Biogeochemistry 95: 37-59. Bradford J.B.; Weishampel, P.; Smith, M-L.; Kolka, R.; Birdsey, R.A.; Ollinger, S.V. ; Ryan, M.G. 2009. Detrital carbon pools in temperate forests: magnitude and potential for landscape-scale assessment. Canadian Journal of Forest Research 39: 802-813. Bradford, J.B.; Birdsey, R.A.; Joyce, L.A.; Ryan, M.G. 2008. Tree age, disturbance history, and carbon stocks and fluxes in subalpine Rocky Mountain forests. Global Change Biology 14: 2882–2897. Bradford, J.B.; Weishampel,P. ; Smith, M-L.; Kolka, R.K.; Hollinger, D.Y. ; Birdsey, R.A.; Ollinger, S.; Ryan, M.G.. 2008. Landscape-Scale Carbon Sampling Strategy – Lessons Learned. Pages 227-238 in CM Hoover, editor, Field measurements for forest carbon monitoring: A landscape-scale approach, Springer, New York, NY, USA. Bradford JB and MG Ryan. 2008c. Quantifying soil respiration at landscape-scales. Pages 143-162 in CM Hoover, editor, Field measurements for forest carbon monitoring: A landscape-scale approach, Springer, New York, NY, USA. Sherrill, K. R.; Lefsky, M. A.; Bradford, J.B.; Ryan, M.G. 2008. Forest structure estimation and pattern exploration from discrete-return lidar in subalpine forests of the central Rockies. Canadian Journal of Forest Research, 38, 2081-2096.